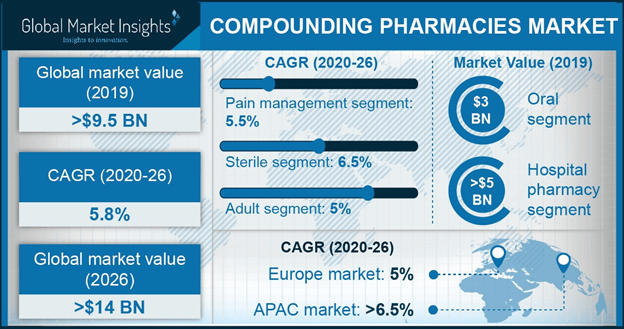 Compounding Pharmacies Market size was valued over USD 8.5 billion in 2017 and is expected to witness more than 5% CAGR from 2018 to 2024. Rising geriatric population coupled with favourable demographic trends such as improved life expectancy will render significant positive impact on compounding pharmacies market growth. Geriatric population often requires drug excipients and dosage forms that are different from commercially available products. In such scenario, compounded medications tailored to individual needs allow superior management of disease conditions. As a result, demand for compounded medications will go hand in hand with rising number of geriatric population. North America and Europe region have witnessed significant drug shortage over past few years. The reason is attributable to the product delays, inconsistent supply of raw materials and product quality issues. Shortage of drugs may have serious repercussion such as death of patients. Lack of timely availability of standard drugs will stimulate the demand for compounded medications. High cost of sophisticated equipments required for compounding medicines coupled with dearth of availability of skilled workforce will impede the industry growth to some extent over the forecast timeframe. Ever changing regulatory scenario will further hamper the industry growth affecting the production of compounded drugs on large scale. Oral product segment dominated the industry with revenue of USD 2,872.5 million in 2017. The high market value is attributable to the increasing demand for compounded oral medication, especially in the field of pain management. Furthermore, the liquid oral dosage forms are preferred due to associated convenience and ease of administration. Geriatric people often desire liquid oral dosage form in replacement to commercially available dosage forms. Oral product segment is followed by parenteral segment that is forecasted to grow at a robust CAGR of 6%. Drugs compounded as parenteral dosage form are rapidly absorbed and show better efficacy compared to other dosage forms. However, parenteral compounding is stringently regulated that can restrict the segment growth to certain extent. Moreover, high cost parenteral medications and requirement of skilled persons for administration will limit the segment growth. Adult application segment with a market value of USD 4,113.6 million in 2017 will show a robust growth over the forthcoming years. Increasing prevalence of viral, bacterial, cardiovascular, respiratory and oncology diseases in adult population will largely support the segment growth. Women in the age of 40-50 years suffering from hormonal fluctuations need compounded hormonal medications. This further supports the segment growth over the forecast timeframe. Geriatric population segment is forecasted to witness robust growth rate of 6.7% over forthcoming years. Percentage of adult population is expected to rise from 11% to 22% of the total population by 2050. As geriatric patients are in great need of compounded medications tailored to specific needs, such stupendous increase in number of geriatric patients will support the segment growth. Hormonal replacement therapy segment accounted for USD 3,425.3 million in 2017. Compounded hormonal therapy is designed considering the level of hormones in individual patients. This allows far better management of conditions compared to commercially available drugs with standard dose. As a result, the demand for compounded hormonal therapy is increasing especially from the women in the age group between 40-50 years. Pain management segment is the growing at CAGR of 4.6% owing to increasing demand for compounded medications in the area of pain management. Number of accidents and consequent orthopaedic disabilities are constantly increasing. For instance, The Association for Safe International Road Travel reported that around 1.3 million people die of road accidents each year. Rising number of accidents will escalate the demand for compounded drugs for better pain management. U.S. dominated North America industry dominated by U.S. compounding pharmacies market with the revenue of 4,781.2 million in 2017. Ongoing technological advancements leading to manufacturing of superior quality drugs coupled with favorable demographic trends will enable U.S. to retain higher revenue share over the forecast period. High awareness among patients and availability of sophisticated infrastructure required for compounding activities will drive the regional growth. Germany is forecasted to show robust growth rate of 5.4% due to presence of government initiatives supporting compounding pharmacies market growth. 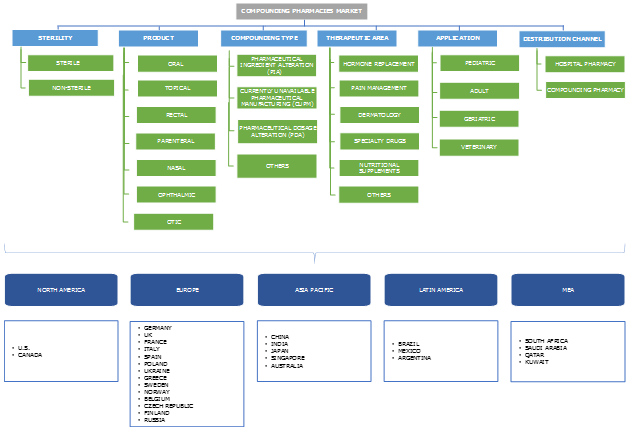 Moreover, availability of superior technology and improved operational capabilities of the pharmaceutical companies will expand the industry growth in forthcoming years. Some of the leading players include Fagron, PharmaMEDium, B.Braun Medical, Institutional Pharmacy solutions, triangle compounding Pharmacies, Cantrell Drug company, Fresenuis Kabi, Lorraine’s Pharmacy, Wedgewood Village Pharmacy, Doughtery’s Pharmacy, Village compounding Pharmacies, Mcguff compounding pharmacy services, Rx3 Compounding Pharmacy, Pencol Compounding Pharmacy, ITC Compounding Pharmacy. Industry players are adopting inorganic growth strategies such as mergers and acquisitions to acquire and retain higher revenue share. For instance, in May 2015, Fagron acquired JCB Laboratories that helped it to restructure the U.S. sterile compounding pharmacies industry. This strategic acquisition has helped the company to provide superior compounded pharmaceutical drugs that has enhanced the company’s profit. Compounding pharmacies market will witness significant growth during the forecast period owing to increase in the geriatric population base. Elderly population is prone to chronic diseases due to low immunity that has resulted in increasing demand for compounded pharmaceutical drugs. Rising acceptance of compounded medicines in North America and Europe has further supported the market growth. Moreover, high rates of adoption of compounded pharmaceutical drugs due to higher convenience have enhanced the demand resulting in rapid industry growth.